The M. E. Church, South, is the next most numerous, and influential denomination to the Missionary Baptists in the county, but the writer, after soliciting several of its people to give information, whom he thought could and would, has failed to get what he desired, for it was his wish to have given briefly a statement of the churches of the different denomination, and their location, as he has of the Baptists. He searched the ‘”History of Methodism,” by West, for it, and failed there. So he can only give such as is recollected by him. Some of the first comers who knew Rev. 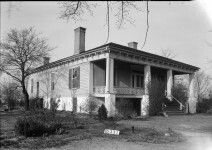 Mr. Willis, say that as early as 1835 he came a missionary of the Methodists and labored in Oakchoy and Nixburg neighborhoods, and succeeded in forming the church at Nixburg, and at Jordan’s. He was a relative of the Suttles by the maternal side. 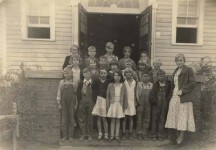 It is presumed that the first M. E. Church was the one at Nixburg. This existed perhaps as early as 1834 or 1835. It was later made a church of the Methodist Protestant denomination, by its leading members adopting the tenets of that body. It was for a good while a strong church of that order, and, was the leading church at Nixburg. 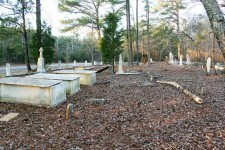 There is a large cemetery there in which sleep a number of those who figured in the early settlement of Coosa. 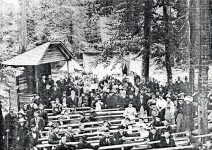 Camp meetings were held at Nixburg for a few years about 1850, and before. 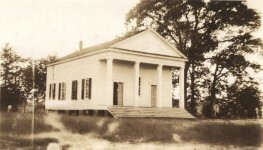 A few miles southwest of Nixburg, there was a good strong Church that was called Ebenezer, but often spoken of as Ellis Chapel, from two prominent members familiarly called “Uncles Ben and Nathan Ellis.” This has always been noted for its congregations. There is a large cemetery there. The writer attended a meeting here in 1850. Still farther northeast, later, there was and is another church with a good membership, in the neighborhood of Mr. William Rogers. 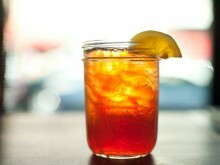 This is close to the county line. There is another church near where Shiloh now stands, about 8 1/2 miles east of Rockford, but this church has been organized probably since the war. About half way between that and Rockford, there is another called Mt. Pisgah, on the Rockford and Kelly ton road, as is the one just before named. 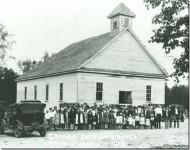 This church has been noted for good meetings and congregations. There was a M. E. Church near here, once with a large membership. A Methodist church existed from an early date about Sockapatoy and Bradford which had a membership in which there was both property and culture. It is thought, but not known, that a church of this order was near where Goodwater now is. One is there now. The first church at Rockford was a Methodist church, begun about 1839. It held sway until 1850, but from then the Baptists took the lead. They have, however, always kept up their existence. At Hanover from an early period they have had a church with a good membership called Andrew Chapel. There is another up in the Mt. Olive neighborhood, and one built in the latter fifties between Hanover and Rockford, called Sears’ Chapel for John Sears, the noted Millwright. At each of these churches there is a cemetery. A large stone shaft marks the resting place of Sears, the leading spirit. There is a Methodist church also not far from the Weogufka church, but its name or date is not known. 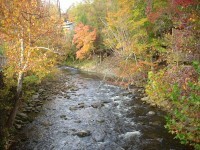 There is also one in Marble Valley, and one in the neighborhood of Stewartville. There was a church below Traveler’s Rest probably called Lykes Chapel, where John Lykes had his membership, and another in the neighborhood of Varners, nearer the river. Still lower down, in the neighborhood of the Olivers, Knights, Hannons, and Whetstones, there was another with “a well-to-do”membership. About a mile east of Buyckville, there was a chapel, but it was never strong. Between Buyckville and Mr. Humphries there was a Chapel that for a series of years was a strong body called Providence Church. Here Mr. Humphries had his membership. Above this, not far from the Turnpike, was the Speers Chapel. 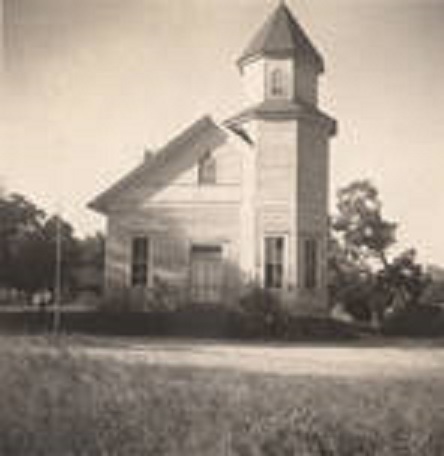 In the Murchison neighborhood there was an old church, still perhaps existing, but the name not known. 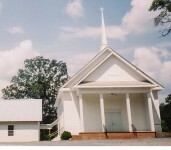 At Brooksville there is a Methodist church, which was among the early places of worship in the county, though never very strong. 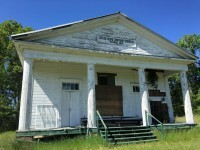 There was a Methodist church remembered near Dr. Edwards, above Central, and one now in Eclectic, that had been there long before Eclectic was thought of, when that was part of Coosa. 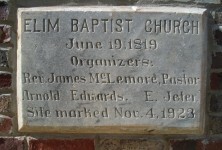 Eli and Fletcher Williams and Kidd and Whetstone were members. Another near the Plank Road, to which McCain, Thornton, and the Rev. Barney Elliott belonged, existed for years before the war. These are all that are remembered, but there were probably others. The Methodist Protestants had churches as remembered by the writer, one at Nixburg already spoken of. They also had one at Pine Grove, east of Nixburg a few miles, where the large Nolan family had their reunion in 1902. There was one near Rev. Albert Crumpler’s, east of Turnpike, called Pleasant Hill, which was for some years a right strong body, where large congregations gathered. There was another at Concord, about 4 miles east of Rockford. And one 4 or 5 miles north of Nixburg, and Flint Hill, about five miles west of Rockford. There were probably others but are not now remembered. This denomination has not been so strong since the war, for just after it, a large number went into the M. E, South, as much, contended for by the Protestants in their organization, had been incorporated into the M. E. System. Most of the talented ministers of the Protestants, and many of its ablest laymen, went over. Rev. Albert Grumpier, A. G. Brewer, James Vanzandt, David. Messer, and William Nolan were the principal resident ministers. I am a first cousin five times removed of Tabitha Jane Sears, wife of John Sears, who together with George and Mary Catherine Sears McEwen built Sears Chapel, just north of Rockford in Coosa County in 1860.